I really can’t say I dislike winter. I have a few objections but overall it’s autumn I dislike, with its end of the season, everything dying, days so short, vibe. So if it’s excuses I’m looking for to explain my blogging absence, the only one I can find is that I have nothing to say. Snow and cold are here and nothing much has changed since November. Fortunately others haven’t been so idle. I’ve been enjoying the posts from both milder and colder climates and since I’m starting to feel a little guilty about not contributing, I guess I should do a little catch-up. Don’t worry, this won’t take long! Meet ‘Bun-Bun’ the newest member of our household. 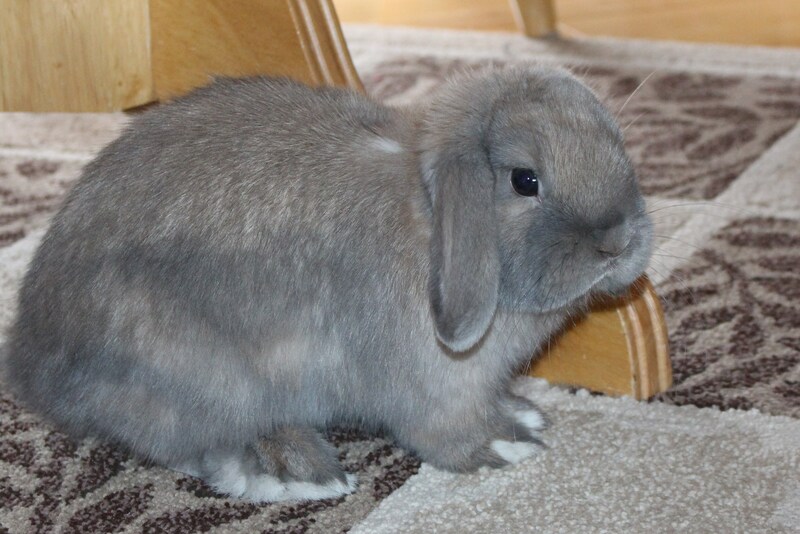 Our little lop bunny with the oh so original name of ‘Bun-Bun’ has been sharing the kitchen since November. He’s messy, hungry, bouncy and just about the cutest thing in our house. BunBun was supposed to live in a hutch on the back porch but softer hearts prevailed and he’s been indoors since joining us. 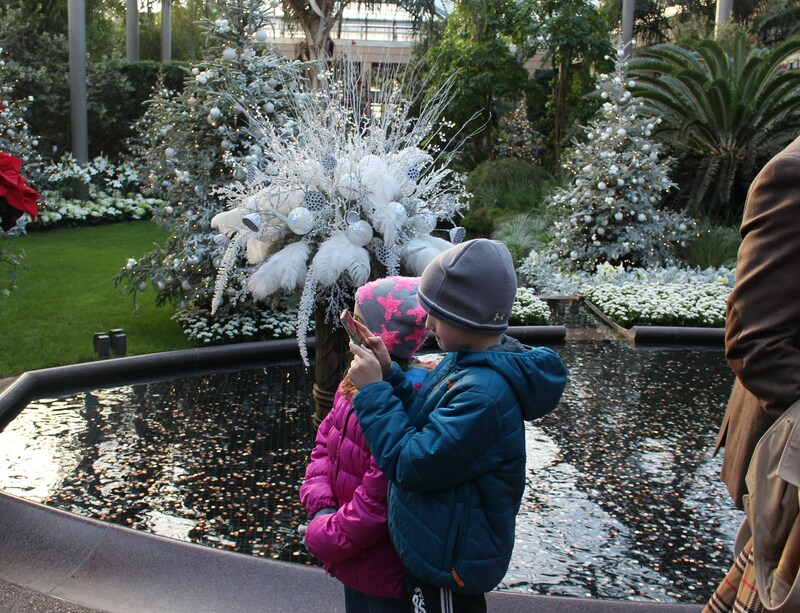 Garden-wise, the annual trip to Longwood Gardens went off (almost) without a hitch this year and we enjoyed the always beautiful indoor and outdoor gardens. I can’t even begin to imagine having a winter garden like this at my doorstep. Coffee here in the morning and then off to work in the greenhouses! The kids still enjoy the trip in spite of other play options and the long drive, so I’ll drag them with me for as long as I can. During this trip the boy got it in his head to use my phone and photograph everything. Who ever suspected a phone could hold so many pictures? Inside the conservatory at Longwood Gardens. This year’s theme was birds, and there were plenty of feather inspired displays. We got there around three in the afternoon to see the gardens during the day and then stayed for the lights at night. The crowds weren’t as bad as in previous years but it was still packed, and I think unless we can get there on an ‘off’ day next year we might skip. 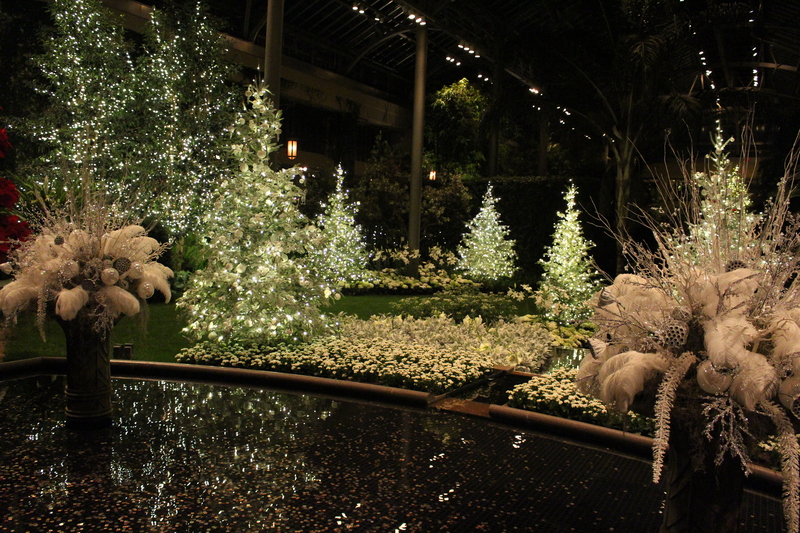 Inside the conservatories of Longwood Gardens at night. Sparkly and magical, just perfect for the holidays. After dark we toured the gardens again and then walked through the greenhouses one more time. Inside the greenhouses there’s a children’s garden which involves several kid friendly fountains and tunnels and hidey-holes which they love playing around in. Unfortunately this is also where the girl wandered off and got a little confused as to where the play area was, so after a little frantic looking around we ended the day with a teary reunion. 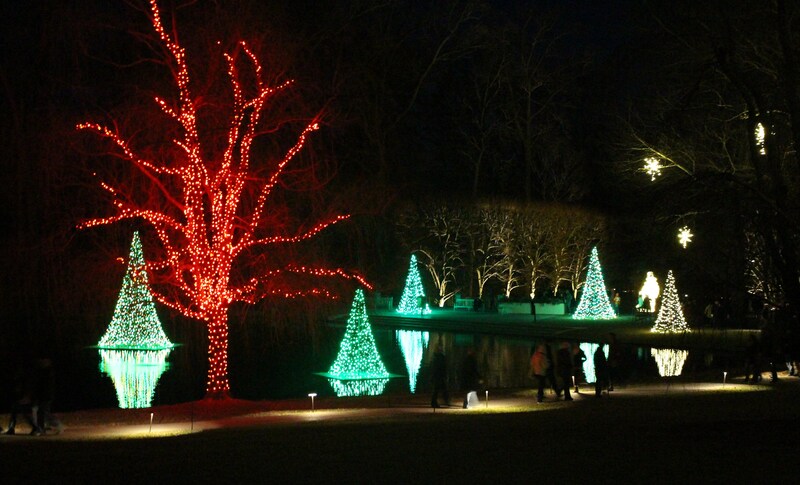 Just a part of the outdoor Christmas light display at Longwood Gardens. Back at home the only signs of gardening are the bookmarked seed catalogs on the kitchen table and the crowded shop lights out in the garage. 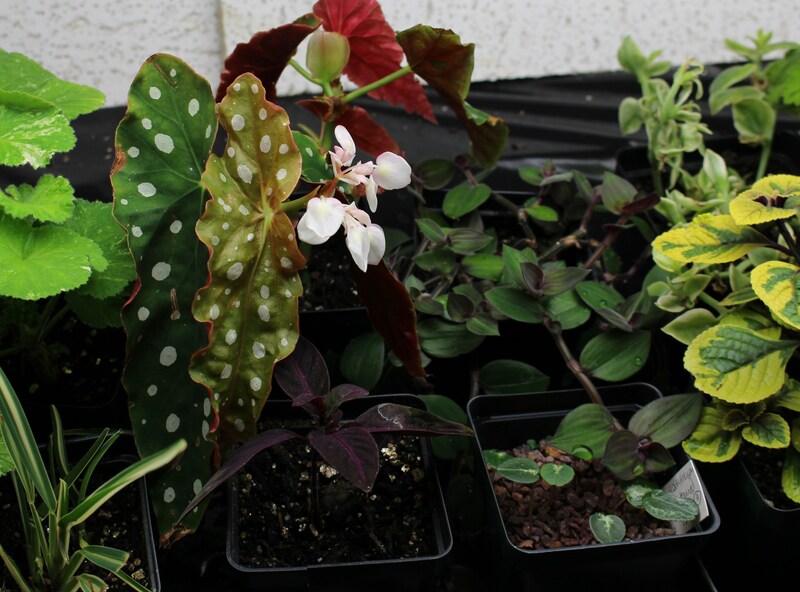 This year’s indoor garden is an odd mix of overwintering tropical cuttings and winter blooming hardy perennials. Out in the garage cuttings are still doing well under the shoplights. This begonia is actually happy enough to throw out a few blooms, while some creeping houseplant is making a play at smothering a potful of cyclamen seedlings. Normally the “winter garden” under the shoplights is reserved for a few cyclamen and forced snowdrops, but this year the tropicals are still out there sharing spare. The plan was to set up a spot indoors for another shoplight setup and move the warm weather plants in there for the winter, but as usual things are slow in coming together. A slightly non-traditional indoor garden jammed full of scented geraniums, houseplant cuttings, hardy cyclamen coum, and a few potted snowdrops. It’s this little garden under fluorescent shoplights which will keep me going while the snow flies outside. It’s maybe 6 square feet of grow space, and won’t be nearly enough when seed starting begins, but right now while the cyclamen coum come into bloom it reminds me that things won’t be frozen forever. This entry was posted in cyclamen, garden tours, overwintering tropicals, winter, winter flowers and tagged cyclamen coum, gardening under lights, indoor gardening, longwood gardens, winter garden. Longwood is just the right place for a jolt of warmth and that smell of growing things. I’d be down there more if it wasn’t so far, you should give it a try -and definitely Chanticleer this summer- it’s that creative and quirky that I bet you’ll like. I have a few of these cane-type begonias. As long as I keep the bigger ones dry and warm enough they bound back from the dead come spring. Bun Bun is a cutie. Very promising that your son wanted to take all those pictures. Soon he can start helping you on your blog. I remember well those family outing moments of high drama. Longwood is a place I am committed to seeing. I suspect my son will just go ahead and start his own blog, no time for flower pictures! Longwood is worth a trip if you can fit it in, even for the non-horticultural there’s the history, fountains, and all that over the top, Gatsby era building. Bun Bun is gorgeous, will he be trained not to eat your plants when next summer arrives? Interesting that you find autumn more depressing than winter. Your plants all look very healthy under their lights. I think I always expect more out of autumn, but then am disappointed when not as much soil prep or transplanting happens compared to what I was hoping for. Oh, how nice to see Bun-Bun! My daughter has a much loved bunny puppet she named Bun-Bun. Your Longwood pics are nice; now I’m kind of wishing I had gone down there. It was kind of discouraging to see their daily Facebook alerts telling us we really need to make advance reservations to avoid being turned away because of a sell-out, and I’m not a big fan of crowds! It must have been a panicky few minutes for everyone involved when your daughter was missing. Glad it ended well. 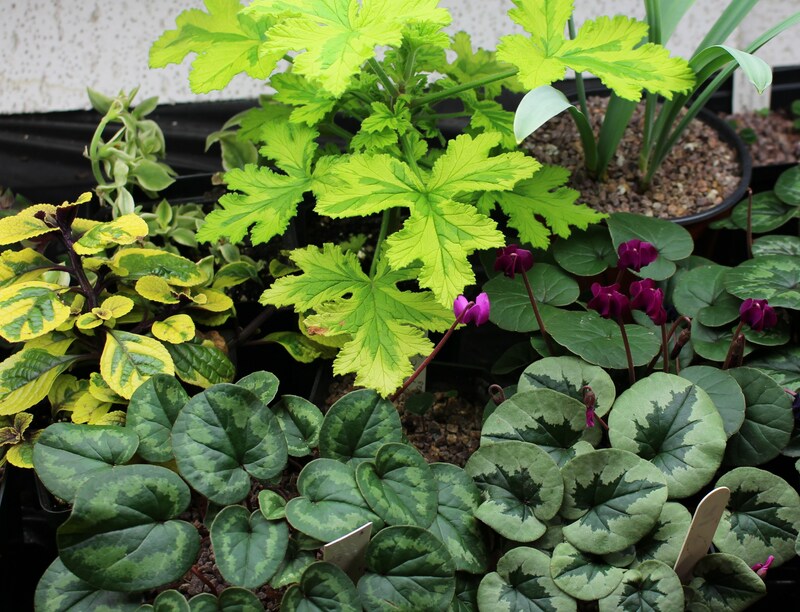 I do like that spotted begonia leaf, and the cyclamen. With all of my geraniums wintering under the lights this year, I am wondering where all the trays will go when it’s time to start seeds! I find autumn more depressing than winter, as well, though autumn this year was pretty darn spectacular and harder to hate than most! Longwood was crowded, but not as bad as the other times I’ve been there. I suppose the tickets work but last year we sat for two hours waiting…. not much fun with a 5 and 7 year old! I’m glad our lost incident happened in the greenhouse and later at night. She didn’t have her coat on so I knew she was still inside, and there were far fewer people than before. By the time I finally admitted she was lost and not just hiding, the Longwood people already had her at the desk. You’re right of course about it having been a nice autumn. The colors were great and it made the season a little more bearable… even if everything was just dying more attractively than usual! I’m glad to hear you’ve been there, it’s such a top-notch garden. There’s a lot of emphasis on grand statements but there’s still enough on the intimate scale to warm any gardener’s winter-frozen heart. I can’t wait to see what the begonia does this summer! I applaud your indoor gardening. This is the time of year when I even get tired of watering the houseplants, would prefer if they just grew themselves while I hibernate. Any news on the space front? Just imagine the damage you could do with a larger yard! Same here 😦 hopefully you aren’t getting as much snow and ice this year. I should pot some up indoors as well. I thought about potting some up and well time has flown by. But speaking of trouble, there are so many plant talks this spring it is crazy- are you planning on going to some? Having patience is a good thing but sometimes it tends to stretch out into years…. Jumping into ‘not quite perfect’ can sometimes be exactly what you needed, and the problems seem to have a way of working out. I hear you’re going to Mass? I’d like to support the first year, but just can’t fit it in to the schedule. I’d love to do that and CT and NJ and really start off spring with a bang! I will most likely do Winterthur as well and I am not sure about what else. I unfortunately could not really coordinate time, funds, work etc going to Mass., hopefully we will be able to get the deeds from others on how it went. Maybe next year. CT was David Culps talk right? What was NJ? Sorry I missed getting back to you! You’re right on Ct being David Culp, NJ is at Rarefinds Nursery. It’s a snowdrop and hellebore event with Pine Knot and Hitch Lyman. Love your indoor garden! Bun bun is quite dear! And thank you for reminding me why moving South was a very good idea! Any time you need a reminder you let me know 🙂 I could go for a nice lowland sunset right about now with saltmarshes and palmettos and a nice drink! I keep telling myself there are only about two short months left until the first signs of spring start showing up. You’ll be off that futon and hitting the parks in no time at all! That bunny really is cute! Good to hear from you Frank. Seems like your cuttings are all doing well and it won’t be long before the first snowdrops pop up. 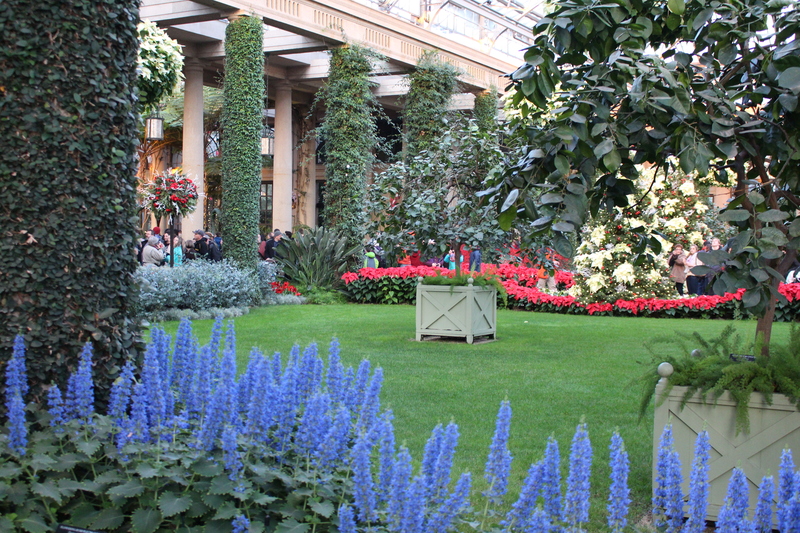 It must be good to see some flowers and lush greenery in the middle of winter at the Longwood garden. Winter doesn’t appear to be getting a hold here this year… but then we still have a couple of months to go! So far it seems like you’ve had just enough snow to make the holidays seem cozy but not enough to wear out its welcome. A little colder than last year but who could really call that winter! It’s not just the sight of greenery, it’s the fragrance of flowers, the warm damp air, and the smell of the soil…. all of it reminds you winter won’t go on forever. Isn’t Longwood fantastic? I try to go every ear too on my way back from a stay in GA. usually in March when not much is happening outside but on my the inside is heaven! Your Cyclamen are gorgeous! Do you keep them in leaf all year or do they get a dormancy at some point? I should dig a few out of my garden and try keeping them indoors just for the flowers! Nice that you make the stop, that’s a long drive and I’m sure stretching your legs for a couple hours is just what you need. I put them outside as soon as the weather stays just above freezing and then completely neglect them all summer. In the shade they get enough rain to keep them happy, the leaves die off for the summer and then around September I watch out for new leaves. Start watering and then when the frosts get serious enough to call them freezes I move them onto the coldest windowsills in the garage. Once blooms come up they go back under the lights. It sounds complicated but it’s mostly half a year of attention and then neglect for the rest! Bun-Bun is adorable! What does it tell you about me that my second thought was “Hey, now he has free manure!”? I went to Longwood once, when I was in high school. The conservatory blew my mind. I hope to get back there sometime, and to fit in a visit to Chanticleer while I’m at it. Your cyclamen look great! I finally transplanted some of the seedlings from the batch of seeds we co-ordered, and they’re hanging tough under some oak trees. They’re droopy after the unusually cold weather we had last week, but they look better than the indoor potted one I’ve got–I don’t have a garage, so its temperature options are either 68 degrees or 30 degrees. All the leaves yellowed and fell off immediately. I put it in the coldest room in the house and hope to nurse it back to health. Tips? Haha, every little pellet which Bun-Bun contributes goes out to the compost pile, and I’m using a clay based litter so that can go out there too! Longwood sounds wonderful. Great to start your little ones early when it comes to all things horticultural. A cute little Bunbun, but he won’ t be so cute in the summer if he starts eating your treasures. I’m trying to keep them dirty and outside for as long as I can. Too much tv and electronics in this house (not my doing) so even if they stray as teens they will hopefully have these memories to fall back on for when they come back to their senses! Bunbun is already testing his cuteness as he samples chair legs and electrical cords. The plants outside should be safe though. Love your little indoor garden, what a super idea! Your bunny is so cute and such a lovely colour. So glad you found your daughter fairly quickly, I know the feeling when they go missing! This was my first lost child, so I’m going to consider myself lucky that it came and went so quickly and painlessly. Until I get my own conservatory I will have to make do with this little indoor garden. I suppose I should be happy with what I have but I do admire others who have a nice room where winter flowers bloom and breakfast can be served! Your indoor garden looks indecently healthy and plants are eager to go out it seems. Longwood must be magical all year. How lucky of you to live nearby. As for the rabbit: he seems lonely…wonder if you’d accept a little gift if I send over our lonely little rabbit for company. 😉 Happy new year, Frank, hope it’ll be a good one! Our bunny would surely love some company and I have no doubt he will find it out in the garden if he were allowed out there. For now though he is a completely indoor bunny. I can’t wait to bring the plats outside, and I also can’t wait to go out with them! I love little Bun Bun, so adorable. Rabbits are such docile pets and fun to have around. I passed right by Longwood on my way to Maryland this Christmas and should have stopped. My cousin had the annual donor’s Christmas party there if I came down a few days earlier too. I sometimes take for granted gardens in that area since I visit them often. Your cuttings look great. I have a few going, but I never have much interest over winter. They are lucky to survive my neglect most years.